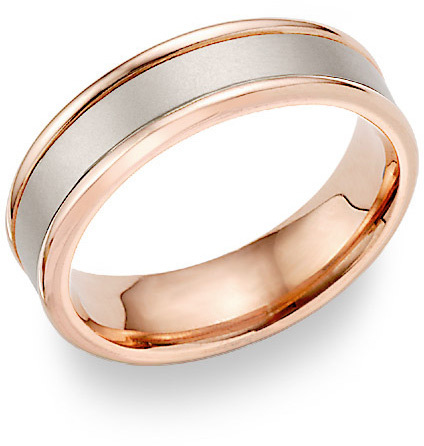 14K Solid Rose Gold and White Gold Wedding Band Ring. Available for men and women, purchased individually or as a set. Brushed / Satin finish center, high polished edges (may be made all high polished by request). Also available in reversed colors, 14K White Gold, 14K Two-Tone gold, 18K Gold or any metal or color combinations by request, including platinum. All materials used guaranteed authentic, including "rose" or pink gold and white gold portions. We guarantee our 14K Rose Gold Brushed Wedding Band Ring to be high quality, authentic jewelry, as described above.